Barneys New York has just launched its second fragrance collaboration with a designer; the first in the line was L’Wren Scott for Barneys New York, and now we have a new scent bearing the name of Greg Lauren. 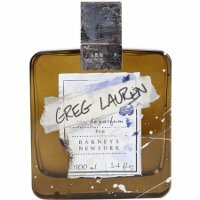 Like L'Wren Scott, Greg Lauren for Barneys New York was developed by perfumer Ralf Schwieger. Its composition includes tonka beans, vanilla, and marine notes that evoke "irresistible sensual emotions." Each bottle is "hand-embellished" by Greg Lauren. All this information about Greg Lauren, the personality, is relevant to the niche marketing of this fragrance, but none of it particularly interests me. I'm not even intrigued by the "one-of-a-kind" bottles, which are meant to look as though they have been sitting around an artist's studio gathering random paint splashes and scratches. This kind of post-Pollock, high-concept grunge just isn't my thing. But what about the fragrance? I'm a longtime fan of Ralf Schwieger's fragrances, and we know from his work on Atelier Cologne Vanille Insensée and Etat Libre d'Orange Fils de Dieu that he has a sophisticated touch with vanilla. It was Schwieger's name, not Lauren's, that made me want to try this new collaboration. The good news is that I like Greg Lauren, the fragrance. It's definitely a vanilla-centered fragrance, but its other notes keep it feeling unusual and contemporary. The vanilla starts off with a boozy thread of tonka bean running through it, and it later turns softer and dustier. The "marine notes" are, most fortunately, not aquatic or ozonic in character. Instead, the marine aspect of Greg Lauren for Barneys New York reminds me of driftwood and dune grass and sea air — it's salty and sandy, and it meshes surprisingly well with the vanilla. I applied this fragrance in the morning, and for a few hours the vanilla seemed more prominent; then the marine notes really emerged; then the vanilla came back into balance. It's an intriguing juxtaposition. I've just re-read Victoria's review of Fils de Dieu on Bois de Jasmin, in which she says that the citrus/vanilla combination of that fragrance "works so well in spite of its unusual layers because of its perfect harmony." Substitute "ocean notes" for "citrus," and you could say the same thing for Schwieger's Greg Lauren. Greg Lauren for Barneys New York could easily be shared by women and men; although many men may veer away from that distinct vanilla note, this scent would probably smell great on the right guy. It has very good lasting power and moderate sillage. Lastly, although I've made a quick visit to Greg Lauren's website and I don't really understand the correlation between this fragrance and his art or his clothing, in the end, it doesn't matter for me. I've removed my little spray vial from its labeled card and tucked it into my purse for touch-ups, since it feels just right for a cloudy and breezy autumn day, no matter what else you're wearing (or who your uncle is). Greg Lauren Barneys New York is available as 100 ml Eau de Parfum ($195) at Barneys. It is a limited edition. 1. For example: Caroline Cagney, "Greg Lauren on His Foray into Fragrance," The New York Times, October 4, 2013. Maybe it’s me, but I wouldn’t spend $195 on a vanilla blend. I’ll shake up some McCormick’s in salt water, thanks. You aren’t alone, I wouldn’t either. hah! Well, we could probabay say that about many fragrance categories. I *could* probably just wear plain rosewater dabbed behind my ears. Very true. Not all vanillas are the same. I think maybe I’ve sniffed too much of it this year though..perhaps that what it is..just bored of vanilla I guess. I didn’t think I would like it at all, because L’Wren’s personal style is not really my style — but I do like the fragrance! It’s complex and grown-up. I’m the opposite—I just might spend $195 for a sophisticated vanilla that doesn’t smell like a cupcake. “Driftwood and dune grass and sea air” sounds like an interesting combination. I’m sure I will try this one eventually! this one seems too aquatic for my tastes, though..do report back if you try it!:D. Yep, tastes do differ! If this one were available in a smaller bottle, I’d consider taking one home with me. Yup me too–considering that my only other vanilla love is something like $440 for 100ml (need we even say which line would have prices so outrageous? Le Labo, natch), $195 for a non-cupcake vanilla starts to seem like a (perverse) bargain! Will def try and get a sniff if I can–thanks for the review, Jessica! Le Labo… HAH! That *is* ridiculous! I think it sounds lovely and worth a sniff, but due to the limited distribution and time frame and high price–chance are good I’ll never give it a try. I’ll be at Barney’s in Vegas in the spring–so maybe there’s a shot, but it would have to be pretty special to warrant spending that price on a single sniffing outing! If you do see it on your trip, give it a sniff! I’m sure you can find another vanilla to love in the meantime, however. I’m so glad you had the opportunity to sniff it! I do think it’s well done. I tried this today and liked it; however, it smells very similar to Atelier Cologne Vanille Insensee and Byredo Gypsy Water. I am trying to pinpoint what is common amongst all three and while I know vanilla is in all 3, there is something else common. I’ll probably stick to Vanille Insensee (much cheaper and well made). I haven’t tried Mona’s Vanille, how is that one, if anyone has tried it? It seems like it would be something I’d really like…for the cloves alone:). If you live in the U.S., email me (click on my name) and I will send you a small sample of the Vanille. That is so sweet of you, I will send you something in return:D.
Thanks, Hajusuuri! I don’t know the Mona d’Orio line as well as I ought to. I just had to say this: vanilla, tonka, and marine notes do sound like a recipe for “sensual emotions,” in particular, rubbing one’s stomach after the scent led to vomiting. Seriously, I’ve never encountered a successful rendering of this kind of idea; it screams out “chemical soup,” but I’d certainly love to be wrong about it. If they could only get these kinds of ideas to smell at least somewhat natural ! Well, I that wasn’t my physical reaction to this one, thank goodness!! Off topic but I’d love for NST to do a review on Bottega Veneta Pour Homme. I liked it but have heard so many different opinions about it. Many negatives, some say it’s one of the better ones of the year. Maybe we can get Kevin to cover it!